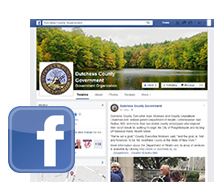 Dutchess County Online offers various ways for website visitors to be notified of important County news, events, public health updates, alerts and advisories and more. 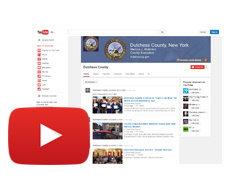 Sign-up with our DutchessDelivery Service to receive updates on a variety of topics on our website; subscribe to our Web/RSS feeds to get the latest in County Government news and information; find us on Facebook; follow us on Twitter; or watch us on YouTube. By signing-up with DutchessDelivery, you will be notified via email, text messages (for some topics), and social media when subscribed-to content is updated. Click on the following link to read more about this exciting new service - DutchessDelivery Service. 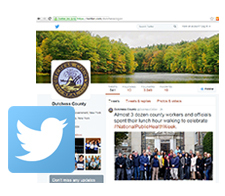 Dutchess County Online provides web feeds (RSS format) for news releases issued by the Dutchess County Executive and other Dutchess County departments, and public health alerts, updates and advisories from the Dutchess County Department of Health. Our RSS feeds give viewers a brief "teaser" of the newly posted information along with a direct link to the complete updated content on our website - no need to navigate through the site to reach the pages containing the new information! Feeds are in xml format. To view or subscribe to one of the following feeds, open the links with your aggregator or feed reader. See Web Feed HELP for more information about feeds and feed reader software.